Arranged by Lisle Crowley. Creative Concepts Publishing. Classical Period, Impressionistic and 20th Century. 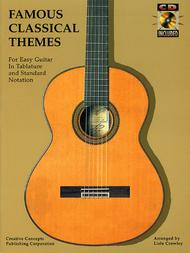 Easy guitar tablature songbook (softcover) and examples CD. With guitar tablature and standard notation. 80 pages. Creative Concepts #074080. Published by Creative Concepts (HL.315167). ISBN 1569221707. 9x12 inches. Arranged & performed by Lisle Crowley. This book/CD pack features easy guitar arrangements with tab for 24 favorite classical themes, including: Blue Danube Waltz * Bridal Chorus * Canon in D * Clair De Lune * Moonlight Sonata * Surprise Symphony * To a Wild Rose * William Tell * more. Excellent book, used to check it out at our library until it disappeared one day.Looked for months to get ISBN to find it. Easy to play and good selection. Thanks. This book has helped me thoroughly, my reading skill have improved tremendously. I love the cd included because it helps you to know how exactly the pieces are played. I have taken classes but this book has really helped me more in my playing. Easy to play - I am a level 1 player. Not very challanging but fun thus, as with all fun things, skill building is easier. I didn't appreciate the TABS. It's too easy to let your eyes wander from the musical notation. All songs are easily recognized and well arranged. Level of difficulty is well graded from obtainable to a beginning melody player to more challenging. 34 of 71 people found this review helpful.